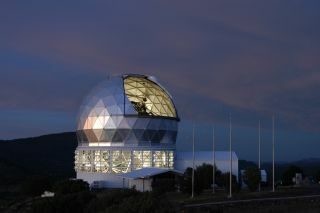 The mirror of the 9.2-meter Hobby-Eberly Telescope is visible through the open louvers in this twilight view. In daylight, the flagpoles on the right show the flags of the five HET partner institutions. The sprawling wildfires in Texas knocked out power to the McDonald Observatory, stalling astronomical observations as firefighters battle the intense blaze. "We're without power at this point," said Anita Cochran, the associate director of the West Texas observatory, late Monday (April 11). "They're hoping to have power back by the end of the day." The West Texas observatory has also doubled as a temporary shelter for local area residents fleeing the wildfires, Cochran added. Wildfire weather conditions over the weekend were among the worst in the state's history. Dry grass and dry air, along with hot temperatures and howling winds, are fueling the sprawling wildfires that have scorched tens of thousands of acres across the state, according to the Texas Forest Service. The threat is serious, but not unusual, Cochran told SPACE.com. The McDonald observatory is safe for now, but that could change. The wind has shifted and is bringing the fire back around, Cochran said. "It's getting a lot closer again, so we're a little more concerned again," Cochran said. The observatory's dome is shut and backup generators are powering the astronomy center and the Hobby-Eberly telescope, the 4th largest in the world. The observatory does not have enough power to open the roof, but it would not conduct observations anyway, because smoke corrodes the mirror surface, Cochran said. The observatory was shut down to astronomers, but was briefly home to Fort Davis residents that were forced to flee their homes as the fires raged toward them on Saturday. The number of evacuees wasn't counted — perhaps 30 in rooms and a handful of RVs in the parking lot, Cochran said. "We just put them up and fed them and did whatever we could," Cochran said. The local power company told the observatory that power could be turned back on by the end of Monday, Cochran said, but that could change if the fires return. "We're worried and we're watching the fire carefully," Cochran said. "If we have to evacuate we will and if we have to open our doors again we will." Brett Israel is a staff writer for OurAmazingPlanet, a sister site to SPACE.com. You can follow him on Twitter @btisrael.